All things pink and red haven’t just been at our craft table and in our printables, they are popping up in the kitchen too. 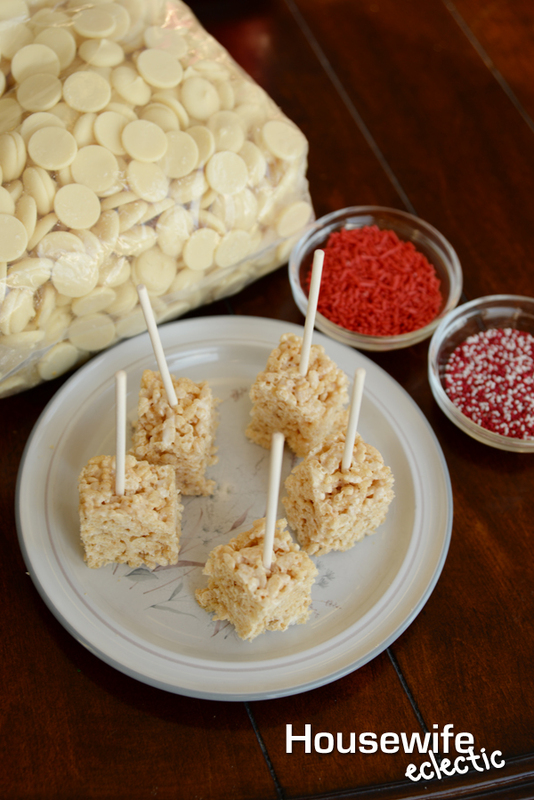 Today I am sharing one of our favorite treats to make for Valentine’s Day. They are festive and so easy to make them coordinate whatever event you are throwing! If you are really in a pinch for time, you could use store bought treats and just dip them in chocolate! Melt the butter in the bottom of a large bowl. Pour the marshmallows on top. Microwave in 30 second intervals until the marshmallows are just melted. It is possible to scorch marshmallows so watch them closely. They are ready when they look mostly melted with a few visible lumps still left in them. Mix the marshmallows until smooth, adding the salt and vanilla. Add the box of cereal and mix until they are thoroughly covered. Spray a 10×13 pan with non-stick cooking spray. Dump the mixture into the pan. Wet your hands and shake off the excess water. Press the mixture down into the pan. The moisture on your hands will keep the cereal from sticking to your hands. Allow the pan to cool completely. 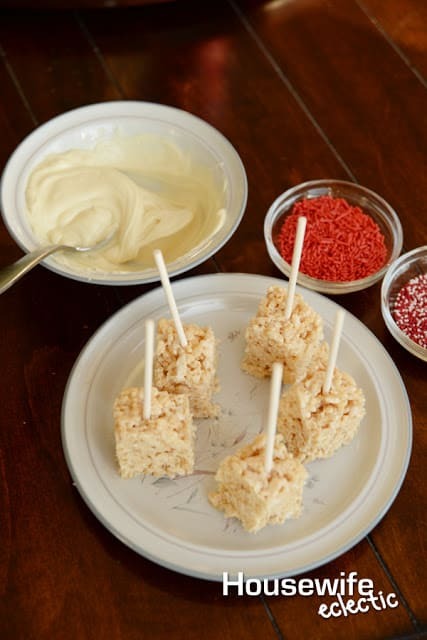 Cut the Rice Krispie treats into squares and put a popsicle stick through each one. 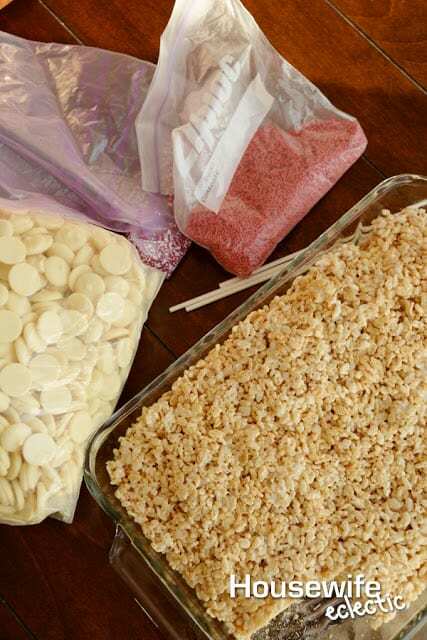 Melt the white chocolate in a bowl, 30 seconds at a time until the chocolate easily stirs smooth. Dip the bottom of each pop into the chocolate and then immediately dip them in sprinkles. Allow the pops to set on a sheet of wax paper. I love to wrap each pop in a cellophane bag and give them as Valentines. What is your favorite red treat? Those are very cute. I love how easy they are to make, too! We do love rice krispy treats in our house! I'll have to try and make these if my older daughter's classroom does a Valentine's Day party. Gotta love a good rice krispy treat! A total classic and cute, too! These sound so tasty. I can't wait to try them! I haven't had a Rice Krispie Treat in so long. This makes me want to whip up a batch. What a fun treat. My kids would love to make these. It doesn't get much easier, or cuter, than that! 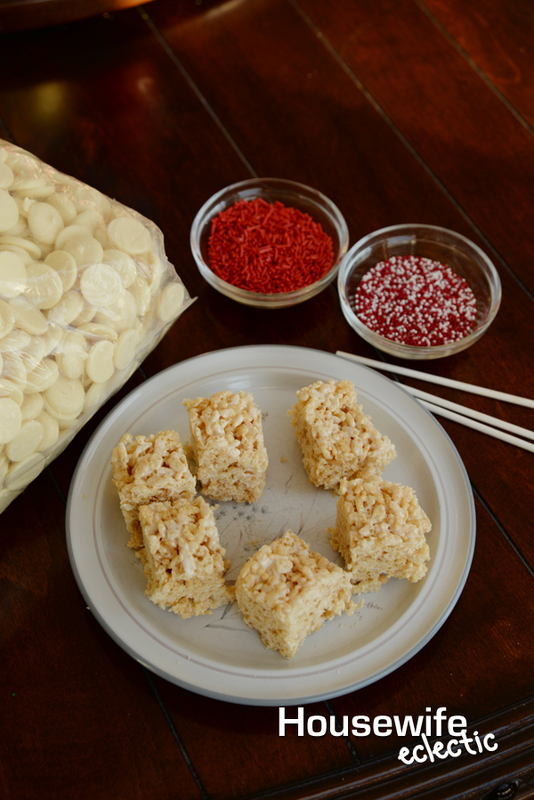 Everybody I know loves rice krispie treats. These look adorable! I may have to steal these for my daughter's birthday. Rice Krispie treats are awesome, no matter the variation! Thanks for this cute Valentine's version. So yummy looking! I love how you can change the color of the sprinkles to adapt to any party or holiday. What a fun idea. It could easily be adapted for any holiday or special event. What a yummy looking snack. I love that this looks easy to make. The girls will love this. 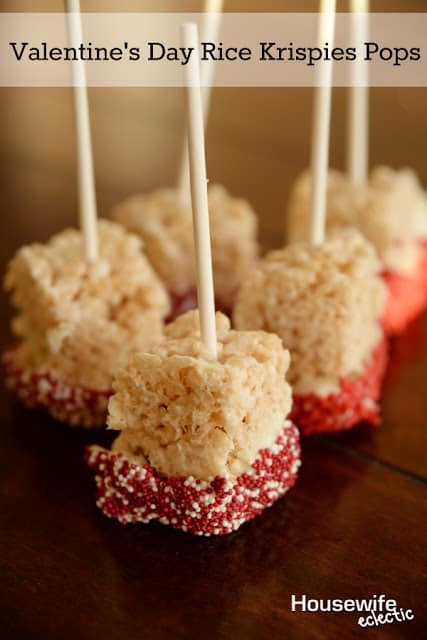 rice krispie treats. one of the best treats ever! Such a great way to dress up a family favorite. And yes, you could adapt these for all the holidays. Cute! My 5yo thinks everything is better with sprinkles! He will love these! I used to love making these! I've never tried dipping them in white chocolate, such a good idea! I really need to make Rice Krispie treats more often, they are so quick, easy, and satisfying. I love the Valentines' Day switch up.